What are the most popular online bachelor's degrees offered in Iowa? According to an NCES report, of the total 363,359 students enrolled in Title IV institutions in Iowa in 2012, 39.7% were enrolled exclusively in distance education courses, making it the third highest percentage of participation in any state. Despite higher education funding being cut 23.8% from '08-'14 and a 12.2% increase in tuition rates during that same period, Iowa maintains a high graduation rate overall, and one of the lowest student loan default rates of any state in the nation. In 2013, 114,809 students were enrolled in some form of online or distance learning program, reflecting the demand for affordable and flexible alternatives to traditional on-campus education. Online education in Iowa has been bolstered in recent years by the creation of the Iowa Community College Online Consortium -- a 7-college partnership of state schools. Noted as one of the best online colleges in Iowa, the Iowa State University system offers over 30 online programs ranging from degree completion programs to professional and graduate degrees. The Iowa Distance Learning Association (IDLA) offers grants and awards for programs in professional development and holds a bi-yearly Symposium presented by innovators and leaders in the field of distance education. The Iowa Communications Network (ICN) provides access to the Iowa Distance Learning Database, a video conferencing hub. With these distance learning initiatives in play, it is clear that Iowa has embraced online education as a powerful resource in developing a stable workforce and growing economy. A comprehensive report by the Iowa College Student Aid Commission outlines emerging trends in Iowa's population, economy and educational system. Recent graduates shoulder some of the highest student loan debt in the country, making affordable online and distance education an appealing alternative to traditional and costly degree programs. If you want to qualify for a range of high-paying job opportunities, earning a college degree is key. When deciding where and what you want to study, you may end up weighing both in-state and out-of-state schools. If you are from Iowa, there are many advantages to attending college in your home state. Sticking close to home can qualify you for in-state tuition and help you build a network of regional professional contacts. You may also benefit from your school's name recognition on the local job market, and you'll be relatively close by if you need to occasionally visit campus. When researching programs, be sure to consider our list of the most affordable online colleges in Iowa. All of the schools in this list are accredited, and our rankings highlight the colleges that offer the best blend of affordable tuition and return on investment. The University of Iowa is not only the state’s flagship university, but also one of the most affordable online colleges in Iowa. The university offers 40 online undergraduate and graduate programs, including a bachelor of science in sport management and a master of arts in educational leadership. Coursework may be asynchronous or synchronous, depending on the program. The school’s most popular programs are its bachelor of applied studies and bachelor of liberal studies, which are broad liberal arts degrees designed for working professionals who already have an associate degree. Students who wish to transfer to UI may transfer up to half of the credits required for a bachelor’s degree. The University of Northern Iowa offers more than 40 online undergraduate, graduate, and endorsement programs to distance learners across the country. UNI strives to be one of the most affordable online colleges in Iowa; distance learners pay a discounted per-credit online student tuition rate. UNI’s programs vary in their delivery methods, as coursework utilizes synchronous, asynchronous, and blended learning depending on the department. Like other online colleges in Iowa, UNI accepts associate degrees and transfer credits from other accredited schools. Iowa State University’s online program offerings include undergraduate degrees, graduate degrees, certificates, professional programs, and degree completion programs. The school’s 21-month master of business analytics program is particularly popular. Programs vary in delivery method; coursework may be synchronous, cohort based, or self paced and asynchronous. Iowa State is one of the largest, best known, and most affordable online colleges in Iowa. All of the school’s online students are able to pay in-state tuition. All transfer applicants who have earned a minimum of 24 college credits with a GPA of 2.0 are automatically approved for admission. Offering asynchronous courses that begin every five weeks, Mount Mercy University is one of the most flexible and affordable online colleges in Iowa. Online students at Mount Mercy receive a huge discount, paying 40% less tuition than on-campus students. This online college in Iowa offers seven online programs, including undergraduate degrees in nursing and health care administration and graduate degrees in business and criminal justice. In order to gain admission, undergraduate students should have a minimum high school GPA of 2.75 and at least a 20 on the ACT or a 940 on the SAT. Graduate students should have a minimum undergraduate GPA of 3.0. Known as the state’s main Franciscan university, Briar Cliff University offers six online degree completion programs. All students who apply to one of these six programs -- offered in accounting, business, health sciences, nursing, operations management, and social work -- should have already earned an associate degree in a relevant field. Briar Cliff has designed its online coursework for working professionals; classes are delivered asynchronously with no scheduled class meetings. As one of the most affordable online colleges in Iowa, Briar Cliff allows its online students to pay a discounted per credit tuition rate. Briar Cliff is unique among colleges in Iowa for its Catholic perspective. Iowa has recently taken measures to lower costs in distance learning by joining an interstate registration reciprocity agreement with other states. Iowa's public universities, all of which offer some form of online learning, don't currently participate in tuition reciprocity programs. For both time and money constraints, as well as residency issues, online postsecondary education can open a lot of doors for students. The most notable online initiative present in the state today, excluding those limited to individual universities promoting their own programs, would be the Iowa Community College Online Consortium, which serves as a partnership between the seven major, regional community colleges in the state. The consortium allows students enrolled at any of the seven universities to take online courses offered by any other school in the network. In addition, the ICCOC has a collection of professors available to support online students in their distance learning endeavors, as well as a digital repository of the textbooks used online in a given semester. 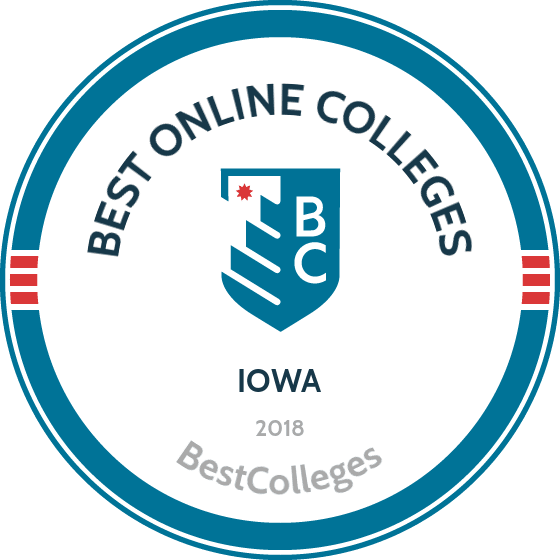 Browse our list of the best online colleges in Iowa for more insight into distance learning programs in this state. 144,223 students were enrolled exclusively in online programs at Iowa's Title IV institutions, making up nearly 40% of total enrollment at such institutions. Less than 15% of those students were living in Iowa; the remaining 85% resided elsewhere in the U.S. while taking classes. Of the 144,223 students, 83% were in undergraduate programs and just over 85% were in private for-profit institutions. Employment growth in this profession is strong in Iowa. According to the Iowa Workforce Development, long term projections show an increase of 17% in the total number of jobs between 2014 and 2024. Wages increased by 5% from 2011-2016. In 2016, what were the top careers in Iowa for people who had a degree in registered nursing? Data source: Iowa Workforce Development, Bureau of Labor Statistics. Data may not be available for every year. Employment growth in this profession is poor in Iowa. According to the Iowa Workforce Development, long term projections show a decrease of 48% in the total number of jobs between 2014 and 2024. Wages decreased by 5% from 2011-2016. In 2016, what were the top careers in Iowa for people who had a degree in business administration and management? Employment growth in this profession is poor in Iowa. According to the Iowa Workforce Development, long term projections show a decrease of 3% in the total number of jobs between 2014 and 2024. Wages increased by 42% from 2011-2016. In 2016, what were the top careers in Iowa for people who had a degree in liberal arts and sciences/liberal studies? Employment growth in this profession is strong in Iowa. According to the Iowa Workforce Development, long term projections show an increase of 270% in the total number of jobs between 2014 and 2024. Wages increased by 1% from 2011-2016. In 2016, what were the top careers in Iowa for people who had a degree in psychology? Employment growth in this profession is strong in Iowa. According to the Iowa Workforce Development, long term projections show an increase of 21% in the total number of jobs between 2014 and 2024. Wages increased by 21% from 2011-2016. In 2016, what were the top careers in Iowa for people who had a degree in human services?